The commander in chief will not let the Malays become bangsat. 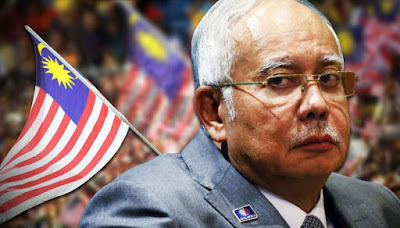 Last Sunday, Malaysians woke up to a beautiful morning, but of course expected the day to be spoiled by more ridiculous statements and incredulous claims from one or more of the Cabinet members. And we were not disappointed. Speaking at the joint opening of the delegates meetings of the Padang Besar, Kangar, and Arau Umno divisions, the mighty leader of the most democratic, most prosperous, most intelligent, best staffed government in all of South East Asia proclaimed that if Umno fell in the next GE, the Malays would become “bangsat” in their own country. “Bangsat” is a rich word that can be used as a noun or an adjective. It can translate into “low, mean and dirty” or “felon” or “scoundrel.” Najib probably used it for “outcast” or “destitute” or both. The rakyat heard it and at first was too stunned to know how to react. They took a long breath collectively, and the silence was heard throughout Malaysia. And then they burst into extravagant and hysterical laughter. What else could they do? The laughter created a wave of sound that must have been recorded by the aliens that my colleague Fa Abdul alleges donated the RM2.6 billion. It was worthy of the Guinness Book of World Records, to say nothing of the Malaysian record, although one must admit that the record for the “Longest Roti Tisu” was just as impressive. So Najib has a talent for comedy, after all. Once they recovered from the laughing fit born of exasperation and sheer disbelief, the rakyat took to their favourite pastime of commenting on the Internet to let the dear leader know that he was dreadfully wrong. Some even speculated that Najib was experimenting with what is known as a “heel” role in WWE wrestling, where the “bad guy” often comes out with bombastic, incredible statements that no one takes seriously. Najib, being the great man that he is, must have sensed that we needed some comic relief from the dark and dreary thoughts of the current economic situation. It is rare to see a leader discard his dignity, all for the sake of the people, and it was proof that although he’s been in power for merely a fraction of Mahathir Mohamad’s 22 years, he has surpassed the good doctor in greatness of leadership. His stewardship of 1MDB has already yielded a RM42 billion debt, quite an accomplishment by any standard. Even the Tabung Haji bailout of 1MDB – we mean the acquisition of key assets in the Tun Razak Exchange that will ultimately earn TH so much money that all Muslims can go for their umrah, speaks volumes of his financial genius. In fact, why are we worrying about becoming “bangsat” since our Prime Minister can raise RM2.6 billion at the drop of a hat? Who else can get so much free money for the nation? Remember that the donor wants nothing more than the simple assurance that Najib will stay in office. Fellow Malaysians, it’s time that we see the light. We must unite behind the man with the money, the man with the 008 license to buy, the man with the plan, and give him the six months he needs to magically produce profits from 1MDB and rescue our economy. With such a shrewd commander in chief, so loved by Arabs with billions to give away, Umno and the Malays will never be bangsat as long as Najib stays in power.